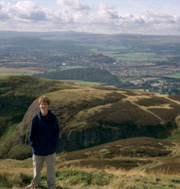 I'm a Canadian PhD student living in Scotland, where I study music, media, and culture at Stirling University. The EU has given the go-ahead to let Sony and BMG, two of the world's "Big Five" record labels, to merge. That means that 80% of the world's music sales will be controlled by four companies: Universal, Sony-BMG, EMI, and Warner. Scary? I haven't decided yet. Check out the details here. Also, the Mercury Music Prize, which judges outstanding albums made by UK or Irish artists in the past year, has just released its nominee list. Click here to find out who's hot.